This is the second in a two-part series. Read The Red Vase, part 1. Bohemia, Novy Bor (Haida), 1914-1920. Gift of Roberta B. Elliott. 2017.3.55. The story of the red vase continues in America. Having survived World War II and flight from Europe, Franz Engel settled into a new life in Washington, D.C. Changing his name to Francis Elliott, he was soon married and, four years later, they had a daughter, Roberta. For the next 50 years, the vase remained safe in their home. A practical woman by nature, Roberta’s mother, Esther, thought the vase was too straight and narrow for displaying flowers and consigned it to the back of a cabinet, where it was largely forgotten. In 2001, when Roberta inherited the cabinet and all its belongings, the vase remained hidden where it was. Her cherished childhood memories of staring at the endless lines in the unique cut glass pattern had all but faded. Roberta’s grandmother Elisabet Engel in 1918, the year she most likely purchased the red vase. Roberta’s father in his U.S. Army uniform, about 1945. Roberta with her parents, Francis and Esther, about 1956. When Roberta was finally ready to savor the exhibition, she was fascinated by what she found. “I was totally absorbed,” she remembers. “I was going from case to case when all of a sudden I had this bizarre premonition that I was going to see something I recognized.” And there, in the very next case, was a vase identical to her own, only it was blue! Stunned, she ran to find her husband, who happily agreed that this was surely an identical piece. In the days that followed, the Cooper-Hewitt put Roberta in touch with the German collector who owned the piece on display, and as luck would have it, he would soon be visiting New York and agreed to meet with her. Roberta carefully wrapped her vase in bubble wrap and ventured back into the city on the commuter transit trains to meet the collector. 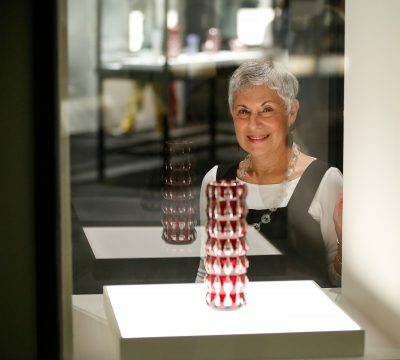 When her vase was authenticated, Roberta learned that it was only the third known surviving example of the design, joining the one on display in New York and another red vase in the collection of the MAK–Austrian Museum of Applied Art / Contemporary Art in Vienna. Astonished that such a treasure had been hidden for so long, Roberta was eager to discover the history of everything else she had inherited. She enrolled in a master’s program in the history of decorative arts at the Cooper-Hewitt, offered in conjunction with the Parsons School of Design and the Smithsonian Institution. Roberta quickly became an enthusiastic student of glass, the Vienna Secession, and Austrian arts at the turn of the 20th century. Roberta Elliott with her family’s glass vase. It was during this time that Roberta’s connection to The Corning Museum of Glass was formed. A group field trip to attend the Museum’s Annual Seminar on Glass affirmed Roberta’s love for the material. Over the following years, she discussed her vase with curators and other scholars, helping her position it within the larger historical narrative. Along the way, Roberta recognized the value of sharing its story with the world and, in 2007, she lent the vase to the Museum. 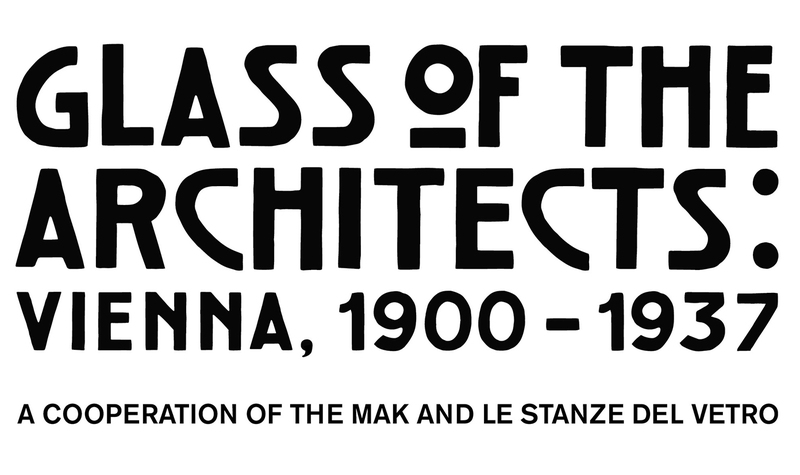 Ten years later, she donated this significant object to the Museum in time for the opening of the exhibition, Glass of the Architects: Vienna, 1900–1937, a cooperation of the MAK and LE STANZE DEL VETRO. 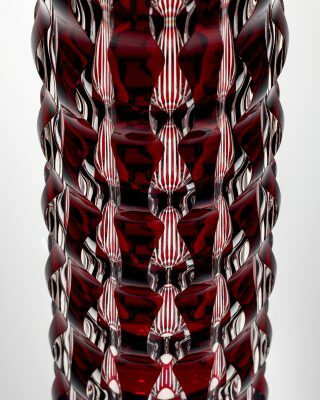 As exemplified in Glass of the Architects: Vienna, 1900–1937, a cooperation of the MAK and LE STANZE DEL VETRO, Austrian glass from 1900 to 1937 emerged from a confluence of ideas, individuals, and cultures. Advanced in large part by the support of Jewish patrons, artistic works of this period captured a newfound modern spirit. This year, 2018, marks the 80th anniversary of Kristallnacht—a horrific night of destruction aimed at Austrian and German Jews (November 9–10, 1938)—effectively signaling the end of this innovative period of artistic production. 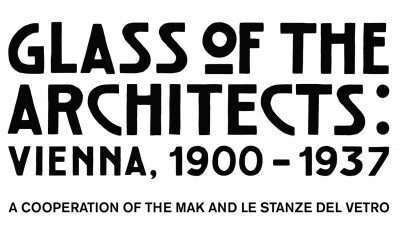 Glass of the Architects, Vienna: 1900–1937, a cooperation of the MAK and LE STANZE DEL VETRO, is on view at The Corning Museum of Glass through January 6, 2019. Learn more about the exhibition.